A reflex action is an automatic, involuntary movement made in response to a specific stimulus. Everyone has a range of protective reflexes, like blinking, coughing and sneezing. 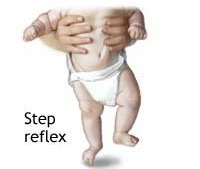 New babies have a range of other survival reflexes, called the primitive reflexes, which are only present during the first few month of life.. After this they are replaced by actions the baby chooses to do - voluntary actions. Response:The fingers close tightly around the object. 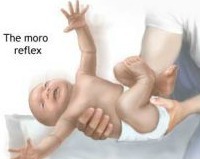 Response:The baby moves the legs forward alternately and walks.